Just a couple of days back, we came across what appeared to be the US-carrier specific 4G variants of the Galaxy Tab A (2017) on the Wi-Fi Alliance website. The Wi-Fi certification listings revealed SM-T387V, SM-T387T, SM-T387P, SM-T387AA, SM-T387VK, and SM-T387R4 model numbers, indicating a launch on all the major US carriers. 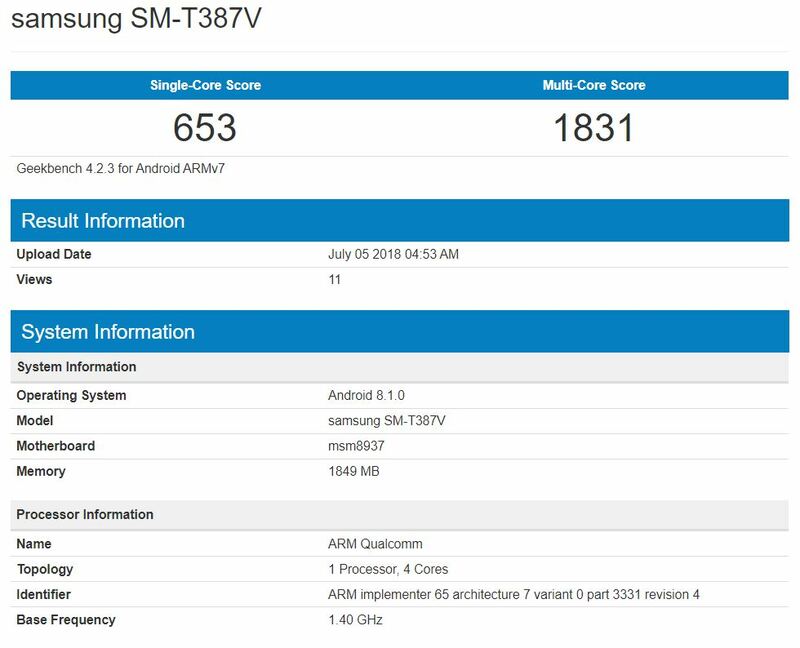 At the time of the report, we were not sure if Samsung will launch an upgraded variant of the Galaxy Tab A (2017), but now a Geekbench listing for the SM-T387V model, presumably the Verizon version, has revealed some information about the specifications. The available data appears to hint that the 4G variant will probably sport an upgraded processor and Android OS version. According to the benchmark, the US 4G version will come with a Snapdragon 430 chipset, which is a slight upgrade over the Snapdragon 425 in the Wi-Fi variant. The listing also confirms once again that the tablet will run Android Oreo 8.1 out of the box, up from Android Nougat 7.1 in the current model. The amount of RAM, however, remains the same across the variants at 2 GB. We currently don’t know when this tablet is going to launch, but Wi-Fi Certification is always a good indicator the launch is around the corner. Also, if this tablet is a minor upgrade over the existing Galaxy Tab A (2017), it is possible the current model will start receiving the Android Oreo 8.1 update very soon.